Ultimate comfort-food-salad from my childhood. This classic homemade Russian potato salad recipe is very forgiving and you can easily customize it to your on taste. Happy Christmas Eve, folks! We finally got some snow on the ground yesterday. And we’re going to have proper white Christmas! Woo-hoo! Just couple days ago, I was looking at bare trees and ground and worried that we will end up with brown Christmas this year. Nope, Mother Nature knows we need that snow now! And for that we are grateful. 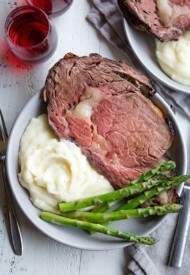 We decided to have our Christmas dinner tonight, cuz my sis-in-law and her family are going to her in-laws tomorrow. I have lots of things to prep for tonight, so I will keep this post short. 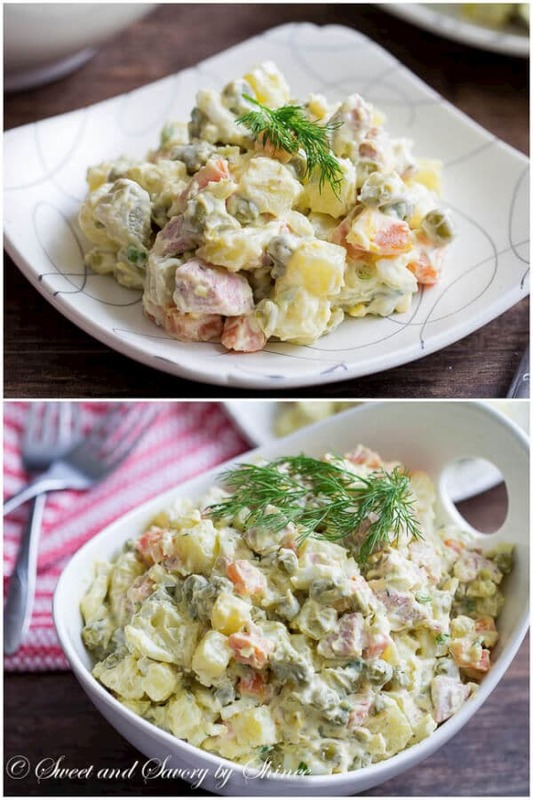 Today, I wanted to share with you my version of classic Russian homemade potato salad recipe (Салат Оливье). You know, I practically grew up on this stuff. New Year’s Eve dinner is just not the same without good ol’ potato salad, tangerines and Champagne. Filled with potatoes, carrots, pickles, peas, hard-boiled eggs and sausage, and dressed with mayo, this salad has “Comfort Food” written all over it. No, not your typical healthy kind of salad here. We’re talking comfort-food-salad! Not that you need this, but as always here is the step-by-step photo directions. The beauty of this salad is that you can customize it to your own taste. Not a dill fan? Add parsley then. Want more mayo? Add more mayo. Sub red onion for the scallions. Use your favorite sausage, salami, or even cooked chicken. Choice is yours. I personally like to use summer sausage. Yep, this salad is a meal on its own. I usually make a huge batch, and enjoy bowlfull for several days. It keeps really well in the fridge. Actually, the longer it sits, the better it becomes. My absolute favorite salad! Merry Christmas, my dear friends! May your home be filled with love, laughter and wonderful memories! Cheers! Comfort-food-salad from my childhood. 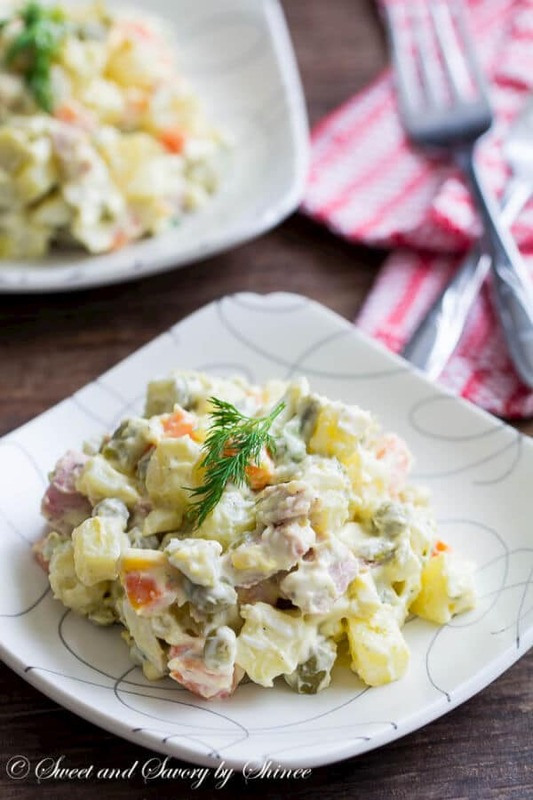 This classic Russian homemade potato salad recipe is very forgiving and you can easily customize it to your on taste. Cut the potatoes and carrots into small uniform cubes. Place them in a large pot and fill with water. Add salt and vinegar. Bring the potatoes to a boil over high heat, and then reduce the heat to medium and continue to cook until the potatoes are cooked through, about 15 minutes. Drain the potatoes and let it cool to room temperature. Cut the sausage and pickles into small cubes, and chop the green onions. If using fresh dill, chop them as well. 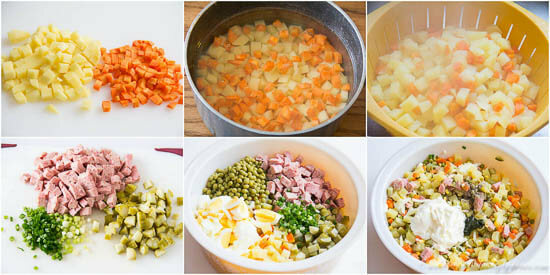 In a large bowl, mix together potatoes, carrots, sausage, pickles, peas and green onions. Add mayo and dill and mix until well combined. Salt and pepper to taste. 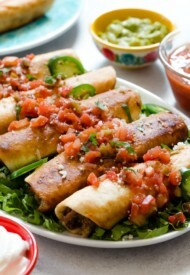 Cover with a plastic wrap and refrigerate for at least 1 hour before serving. This recipe is on point!! Growing up Russian, this is a true classic & your recipe is pretty amazing!! Needed some comfort today(didn’t know all exact ingredients) & thankfully found your recipe 🙂 thanks for sharing!!! So glad you loved it, Bella. This is definitely one of the best comfort foods. 🙂 Thank you for your feedback! This looks so good. Can’t wait to try. BTW, beautiful pictures. What kind of camera do you use? Hi, Rebecca. Thank you for your compliment! This was shot with my Canon 60D camera. Lovely! I love the addition of pickle to potato salads but have never seen meat/sausage added. FYI when I did a Rosolli Salad at Christmas (grated beet, carrot and potato), I learned that if you cook the carrots whole, skins on, you can easily wipe off the skins once they’re cooked and the carrots are so easy to dice up and better yet, they hold their shape. I love the combination of pickles, hard-boiled eggs and potatoes. Well, and the sausage and peas to. So pretty much everything. Thank you for sharing a recipe from your childhood. My pleasure, Jameson. Thank you! I am so excited to find this recipe. Years ago when we lived in Florida, I could get the best Russian potato salad from a local restaurant. I’ve never had it since. Now I can make it! Hope you enjoy this salad. Thanks, Christie! I love old family recipes and this potato salad looks delicious! Just in time for Julian Christmas. Thank you very much, Shinee, for this beautiful recipe. My dad used to make his version of potato salad by adding sliced cucumber, corn, and bell pepper to the Russian recipe. Guess it was his way of keeping his Russo-Japanese heritage alive. For this Christmas, however, I’ll make the potato salad strictly Russian using your recipe. Can’t wait to try it. Thank you once again. Itsuki, yeah, this salad can be customize many different ways. I’ve added fresh cucumbers and corn kernels in the past too, depending on what I had on hand. But this classic version is always great. I hope you enjoy this salad as much as we do. А вы монголка? Хорошо! Моя бабушка по отцовской линии русская, с небольшой примесью монгольской крови. Откуда знаете хорошо русский? Да, я монголка. 🙂 В Эрдэнэте, город где я выросла, много русских жили. И я там училась в русской школе. Вот так вот. Очень приятно по-русски общаться с вами. Hi Shinee! Loving this salad. I actually made it before the holidays. It was always a traditional holiday salad around the holidays growing up. Love your background…grew up in Mongolia and now living in North Dakota. Wow! What a jump 🙂 Where in the world did you learn to speak Russian?! That’s pretty awesome. Haha I know, life is a crazy thing! You never know where you end up living. 🙂 My hometown had a large Russian community, and growing up I went to Russian kindergarden and school. So yeah, Russian is like my second native language. 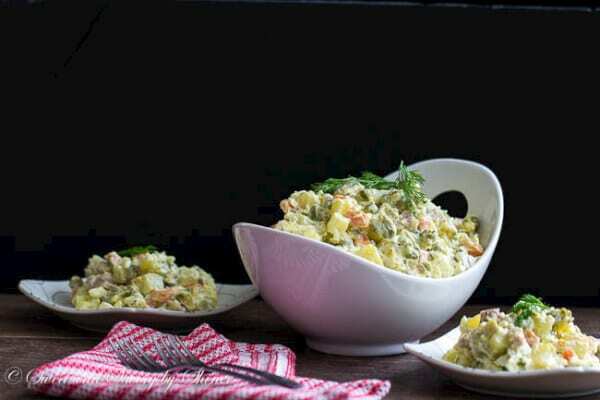 We love this in Estonia, too, though we simply call it kartulisalat or potato salad. I don’t really like peas in my salad, however, and our dressing is always sour cream AND mayo, never just mayo (actually you could omit the mayonnaise altogether and simply use sour cream with a splash of mustard, for example). 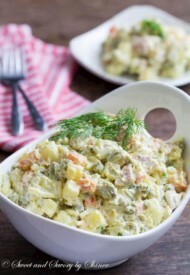 I grew up on potato salad too.. my Russian grandmother used to make it every Sunday for family lunch! Thanks for reminding me how delicious it is Shinee, this is something I need to make soon.